SQL MIN(), MAX() function helps to calculate the minimum or maximum value in a column of a table. Let us see MIN, MAX syntax with examples. 1 What is the SQL MIN Function? 1.1 What is the syntax of SQL MIN() function? 2 What is the SQL MAX Function? 2.1 What is the syntax of SQL MAX() function? What is the SQL MIN Function? The SQL MIN() function returns the minimum value or smallest value of the column. It takes a column name as the parameter. What is the syntax of SQL MIN() function? What is the SQL MAX Function? 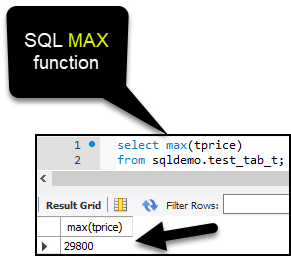 The SQL MAX() function returns the maximum value or largest value of the column. What is the syntax of SQL MAX() function? Here is how the table looks like. Here, the min function found the minimum of tprice column of the test_tab_t. The sqldemo is the schema name. The table tprice is in the sqldemo schema. Just like MIN function, MAX function returns the maximum tprice of the test_tab_t table. We understood the syntax with examples of the following to functions. If you have anything to ask or want to give feedback, please feel free to say it in the comment section below.